Puffins are one of the oddest, most charming and hardest to see birds to see in the United States, but it’s getting easier. 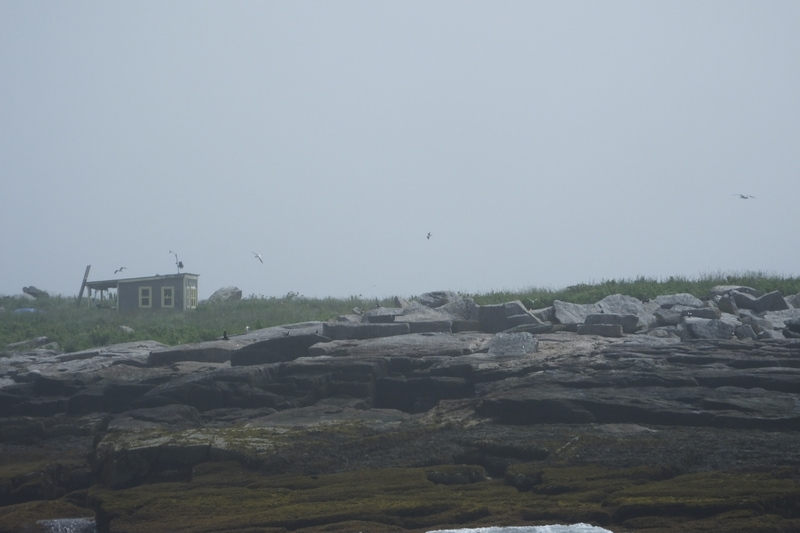 The birds spend almost all their time on the ocean, but for a few months they nest on three islands off Maine during the summer. Most of the action is about five hours’ drive Down East from Maine’s southern border. 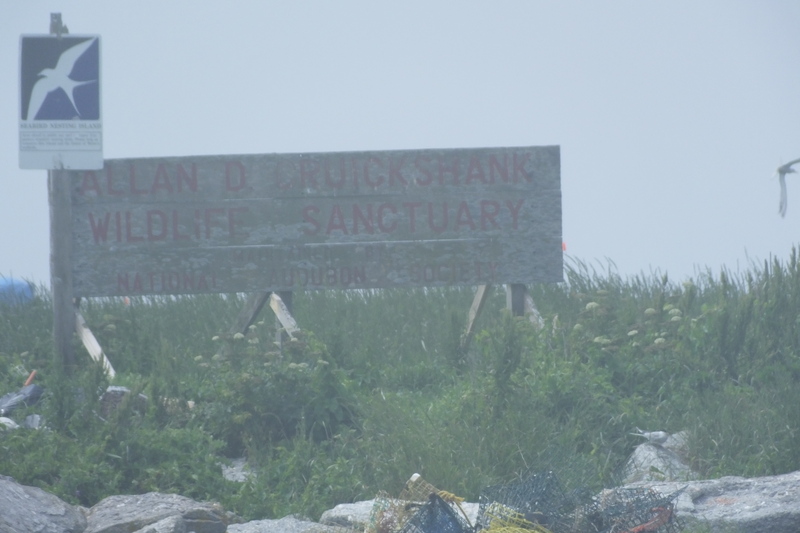 Eastern Egg Rock, by far the easiest island to see if you’re a human just an hour from Portland, now has enough puffins that it’s worth the trip. Puffins once lived on six islands off Maine, but were nearly wiped out by people eating them and wearing their feathers. By 1901 there was only one pair on Matinicus Rock. Protection brought them back hundreds to the upper islands. Since puffins return to the island where they hatched to breed, it seemed unlikely they would ever reclaim their old territory. But biologist Stephen Kress had the idea to transplant chicks from Newfoundland, where they were still all over the place, to Eastern Egg Rock. No one was sure what mechanism they used to find their way home or when it kicked in–was it when they hatched or when they swam out to sea? Kress and the National Audubon Society started moving chicks in 1973 in what became Project Puffin. The first adult came back started in 1977 and their numbers have climbed steadily to 148 nesting pairs as of 2014. That’s an all-time high, but it comes after an alarming dip for a couple years when higher water temperatures cut their food supply and nesting success dramatically. In preparation for the trip I read my three-year-old daughter Ginger the kid’s book Project Puffin over and over. She was so excited to see them. On the way out she started fussing and we figured she was a little seasick. Then she mercifully fell asleep. We got to the island there were plenty of birds to see. 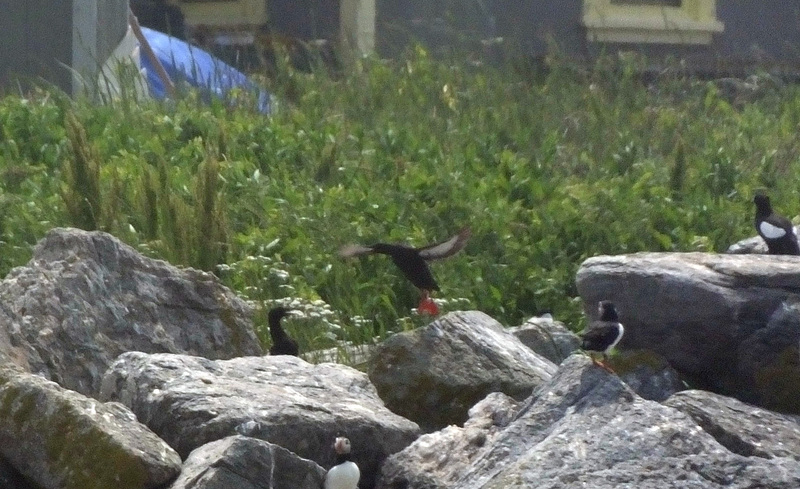 Puffins, terns, guillemots swarmed the island. They swam in the water near the boat. They hopped up and down on the rocks, where each pair took care of one chick, hidden away in a burrow. I tried to wake Ginger up, but she wouldn’t have it. A puffin fly just a few feet over out boat, where Pete Salmansohn, the education coordinator for Project Puffin, told us about the colony’s history. When seabirds were first protected, gulls took over these islands. 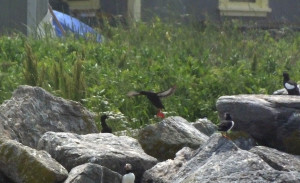 Part of the project was to remove the gulls to make way for puffins. And terns. Ginger would have been delighted; he’s the co-author of her puffin book. 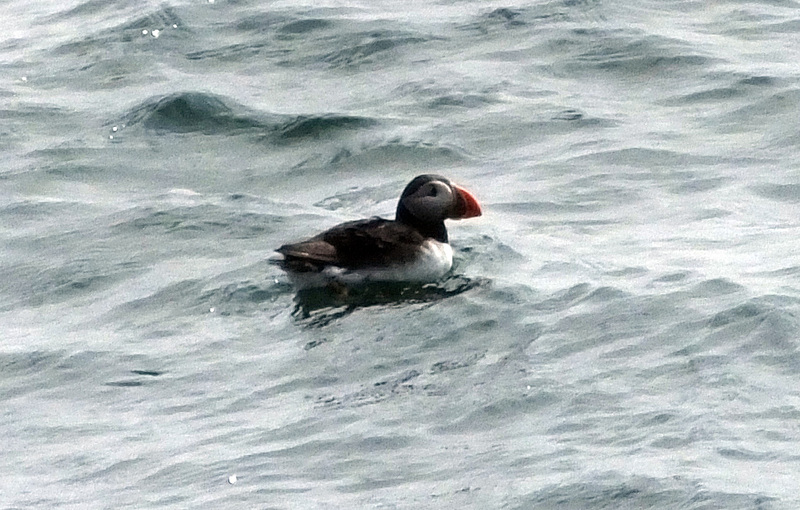 At any rate, we saw plenty of puffins doing all kinds of puffin things: flying, flying with fish, swimming, hopping, hanging out together. We circled the island twice and got a good long look. Ginger woke up as we neared the harbor. She thought we were just getting to the puffin island, then started crying when she realized she missed them. Salmansohn consoled her with puffin keychain. I asked him why Project Puffin doesn’t start reclaiming more of the old puffin islands (Western Egg Rock, Large Green Island) He must get asked that a lot. Puffins were never really in danger of extinction because there are so many of them in Canada and Europe, he said. Terns, now there’s a bird in trouble. Yeah, I don’t think Project Tern will ever really catch on. Does that mean that the whole Project Puffin was just something to give Americans our cute and charming puffins back and make us feel good about fixing a past wrong? A symbolic win for the green team? And I’m just a typical American, excited about the cartoonish puffin while the serious tern is boring people to death? Well, maybe. The biggest threat to puffins now may be climate change. 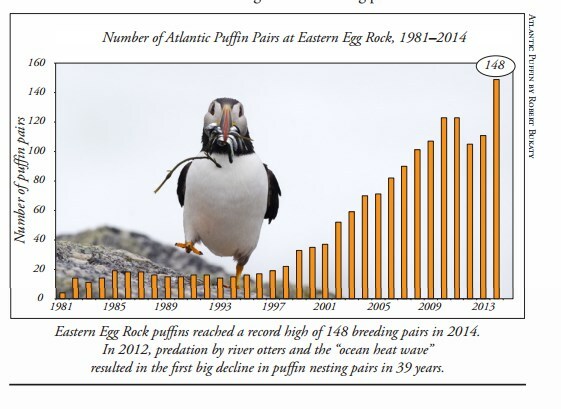 As Mother Jones reported last year, the water temperature has been rising so much in the Gulf of Maine, the puffling’s favorite fishes (hake and herring) aren’t around. There isn’t enough plankton to feed the fish that feed the pufflings. 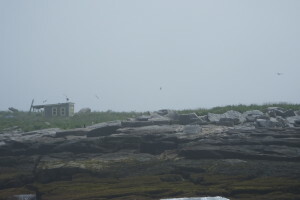 In 2013 one-third of nest burrows went unoccupied and only about 10% of chicks survived long enough to fledge, or leave the nest, on Machias Seal Island. But in 2014 puffin numbers turned around: 85% occupancy and 75% success in fledging. The water temperature rise may have been a fluke. Maybe. We hope so. Because, if not, there’s no easy fix. Transplanting an entire colony of elusive seabirds will seem easy compared with lowering the temperature of the ocean by a few degrees. So get out there and see those cute puffins while you can. Puffins hop near their nest holes, where their pufflings are hiding, waiting for delivery of fish and to grow up. Puffins and terns fly over their nests on Eastern Egg Rock. 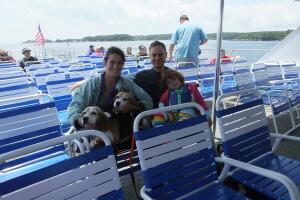 Cap’n Fish’s boat cruise out of Boothbay Harbor lets you buy a $10 ticket for your dog.